A 2015 report warned Sweetwater Unified High School District its budget would be in trouble if it didn’t find a way to cut costs and bring in more money. District trustees went on to OK 3.75 percent raises. Now they’re scrambling to cut $19 million mid-year. 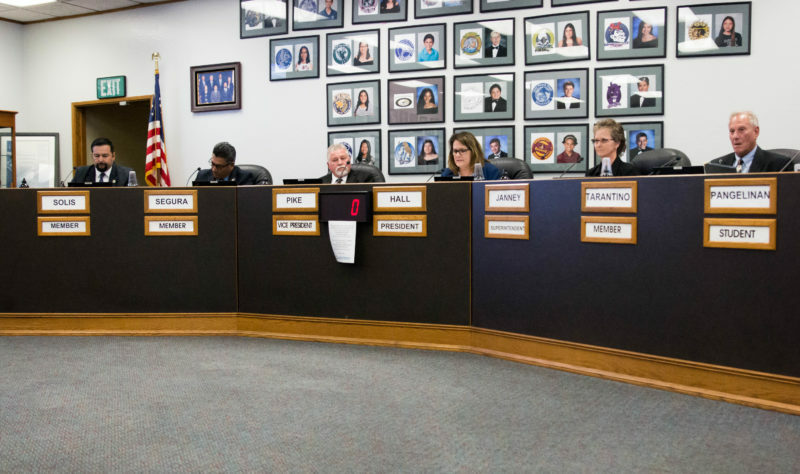 A 2015 report by the state’s fiscal crisis management team warned Sweetwater Union High School District trustees that the district could be in for serious trouble unless it made “difficult budget decisions” in the years to come. The board did neither. Instead, it raised salaries by 3.75 percent across the board. Now, the district sits at the edge of a fiscal cliff. District officials miscalculated their budget by $30 million in recent weeks and are now poised to make some $19 million in cuts to the current school year to avoid receiving an emergency loan from the state. The County Office of Education may approve Sweetwater’s suggested adjustments, or it could appoint a “fiscal adviser” to take partial control of the district. Sweetwater’s current five board trustees – Paula Hall, Nicholas Segura, Arturo Solis, Frank Tarantino and Kevin Pike – all rode a wave of anti-corruption sentiment into office in 2014. They replaced a board that had been engulfed in a bribery and conspiracy scandal spanning Sweetwater Union, San Ysidro school district and Southwestern College. Four Sweetwater board members were charged with crimes, and its former superintendent, Jesus Gandara, served jail time. The board members ran on a platform of transparency and rebuilding community trust. In the wake of the scandal – which included contractors bribing officials to receive building contracts – interim superintendent Tim Glover asked for audits and reviews of many of the district’s practices and books. In October 2014, Glover asked California’s Fiscal Crisis and Management Assistance Team to review its budget as part of his effort to restore trust with the community. The new board members had just been on the job for four months when they heard the FCMAT report on the night of April 27, 2015. Diane Branham and Debi Deal, of FCMAT, told the board members that while their budget looked stable for the current year and the following year, it looked much worse off after that. They were not alarmist and, in fact, told the board the situation did not require excessive worry. But their public presentation belied a more dire picture painted in the report. “Based on [our] projections, the governing board and district administration may need to make and implement difficult budget decisions. Unless revenue is increased, the district will need to implement expenditure reductions to balance its general fund budget and remain fiscally solvent,” the report read. Branham and Deal did make several suggestions for how Sweetwater should change its budgeting practices. Most important, they said, was implementing a “fully integrated position control” system, as the district transitioned to new accounting software. Position control allows a school district to accurately monitor who is being hired, what positions are open and what employees are leaving the district between various departments. Sweetwater spokesman Manny Rubio told me that Sweetwater is continuing to work on a multi-year plan to implement the recommendations of the 2015 report. He wouldn’t say if a position control system had yet been fully implemented. But large mistakes in payroll costs played the biggest part in the recent $30 million budgeting error. The district spent $16 million more than it planned last year on salaries and benefits combined. Then-board president Frank Tarantino called the review “a good outcome for the district.” Board member Paula Hall asked several questions and gave observations about maximizing revenues. The mood seemed reserved, but optimistic. In the meantime, state revenue did continue to go up as the state moved to restore all of the funding cuts that began to hit districts after the 2008 recession. But those increases had already been built into state legislation and the FCMAT auditors, Branham and Deal, had built some state increases into their Sweetwater calculations. During the same time, pension costs and special education costs kept rising. And Sweetwater was also in the process of lowering its class sizes, which would require more teachers. So with no new revenues and no trimmed expenses, as Branham and Deal had suggested, the board moved to raise salaries by 3.75 percent across the board in spring 2017. The raise would be retroactive to Jan. 1 of the same year. For the 2016-17 school year, as the state gave one of its largest single increases to restore the post-recession cuts, the district managed to stomach the partially increased salary and benefit costs. But in 2017-18, when the raises took their full effect, the hit to the bottom line was disastrous. Salary and benefit costs – which represent roughly 90 percent of the budget – spiked by 14 percent across a two-year period. The audit had clearly warned against such increased costs, without increased revenues. Now-board president Paula Hall, herself a budget analyst for San Diego Unified School District, stuck with the current district talking points when I asked her whether the raises had been advisable in the face of the FCMAT report. “Our message on this is that we’re working on it,” she said. “Funding from the state is changing every year, that’s partly why we’re facing this.” I noted that no other districts in the state appear to be dealing with a miscalculation of similar magnitude. “I’m not gonna comment further,” she said.